My little man turned 6 last weekend. As has been the tradition for the past few years, I spent the eve of his birthday finishing a handmade gift while my husband baked the cake (we are total last minute crafters). Rupert is a big fan of all things space at the moment, so this year I made him a small version of the Milky Way sampler. 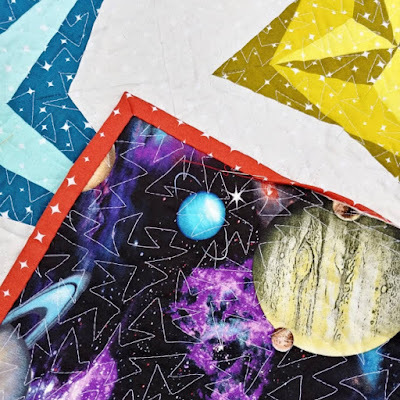 I used prints from the Cloud 9 We Are All Stars collection for the front and a cool solar system print for the back. We play to hang it on the wall in his bedroom above the bookshelf where he keeps his telescope and space books. 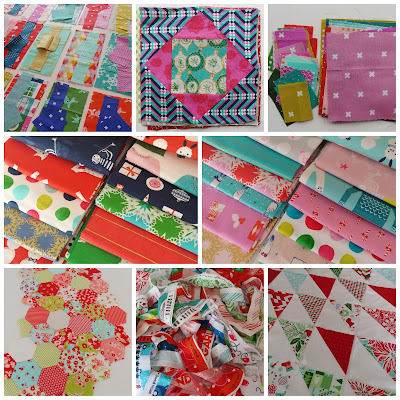 I'm linking up with the Elm Street Quilts One Monthly Goal finishes and the 2018 Quarter 4 finish-along, as this project was my goal for October and on my proposed list of finishes for this quarter. I can't believe we're in quarter 4 already! 2018 has gone by at lightning speed. 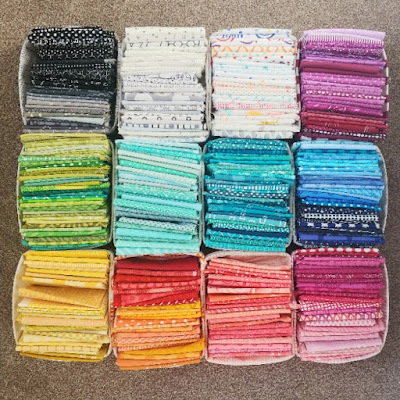 At the start of the year my WIP list was over 50 projects long so I set myself a goal of only working on my WIPs (no new projects) in order to try and get that number down to less than 10. 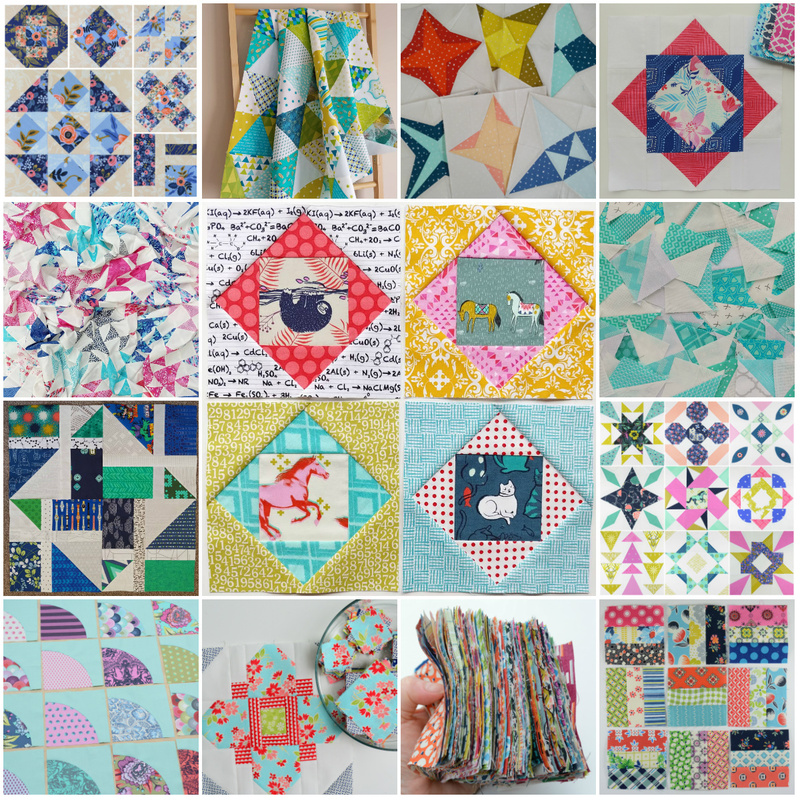 While I've been good on the 'no new projects' front, I haven't been able to keep up with my target of 14 finishes per quarter and still have over 30 projects on my list. 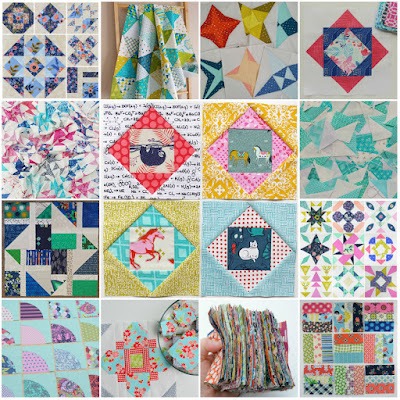 So this quarter I am going to try and blitz my WIPs to see if I can at least get my WIP list to under 25 (half it's original size). 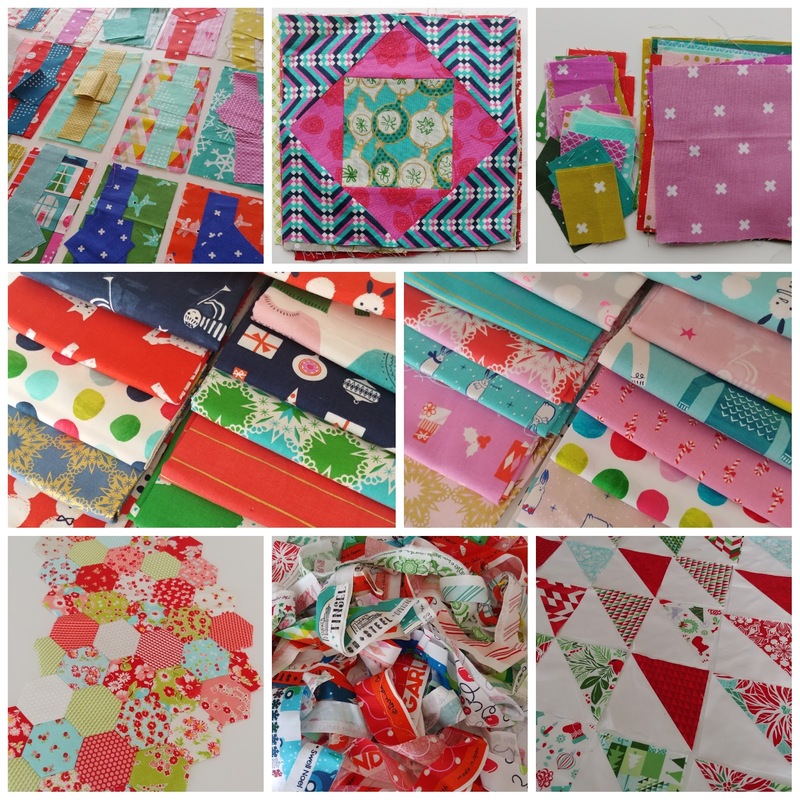 I've picked 21 of my closest to completion projects, including a selection of Christmassy ones. 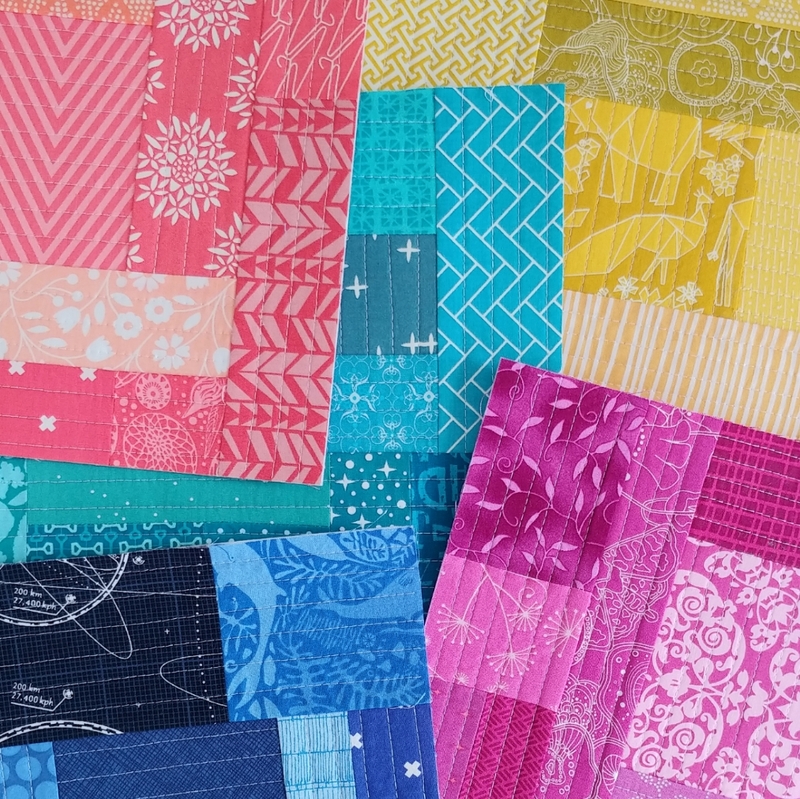 I've deliberately left out all of my hand-piecing and longer term projects (such as a big selvage quilt). All the details are in my embarrassingly-long WIP spreadsheet. Here's an extract describing each of the pics in the collages. Here's hoping for a new personal best in productivity! 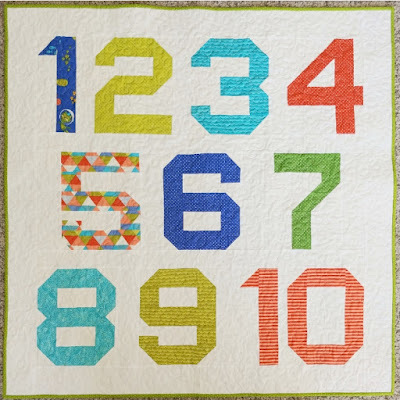 Just a quick post today to link with with Elm Street Quilts One Monthly Goal October Linkup. My goal this month is to finish the Milky Way sampler quilt I started last year. 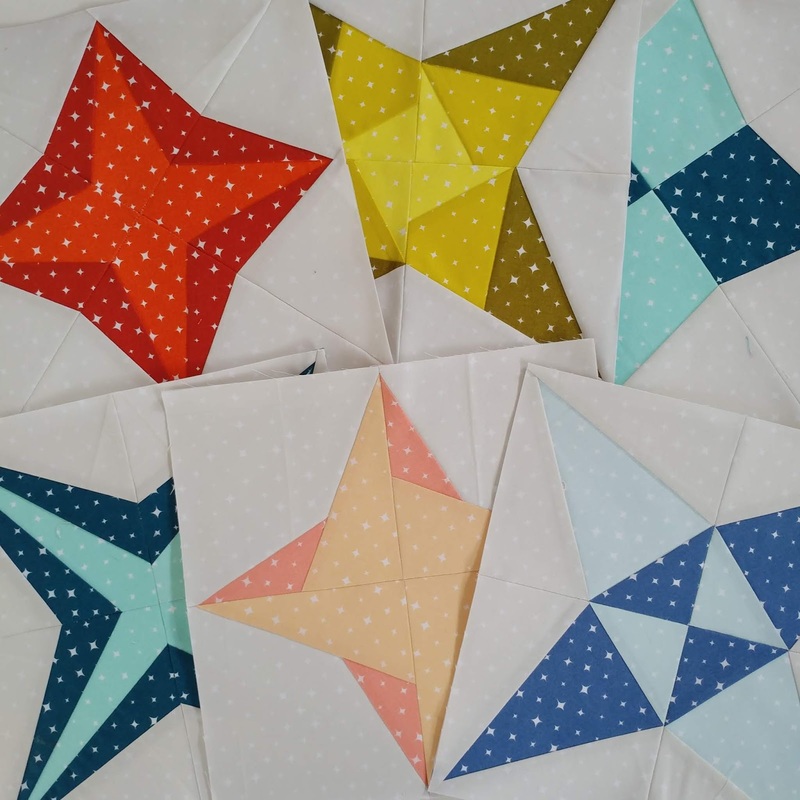 I've got half the blocks already made so I just need to make 6 more and finish the quilt. I think it would make a nice birthday gift for a space-loving boy who is turning 6 later this month. Luckily his birthday is not till later in the month. 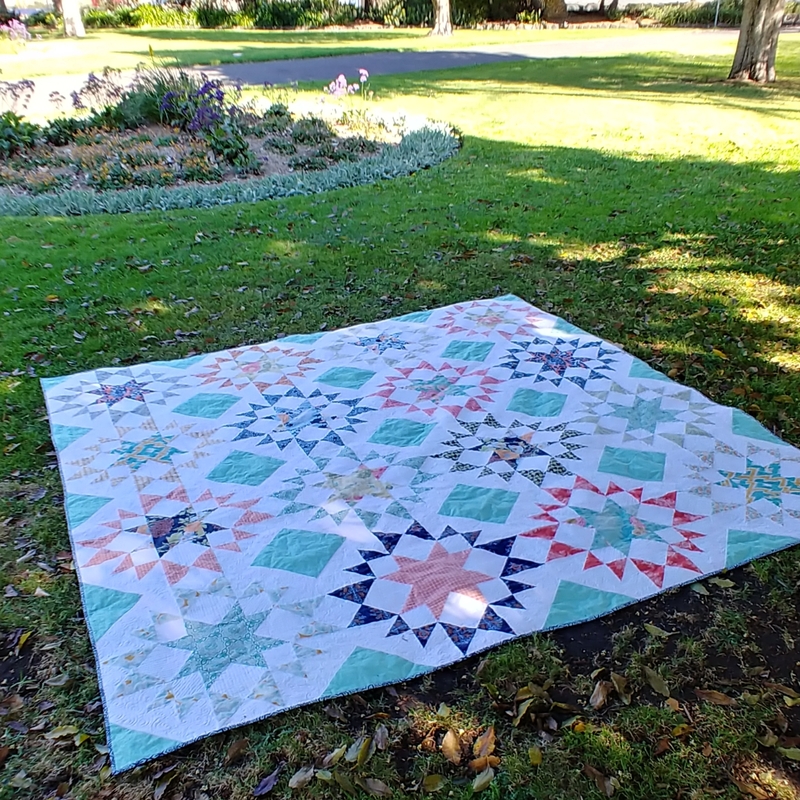 I finally managed to get some better pictures of the trip around the world quilt I finished in July. 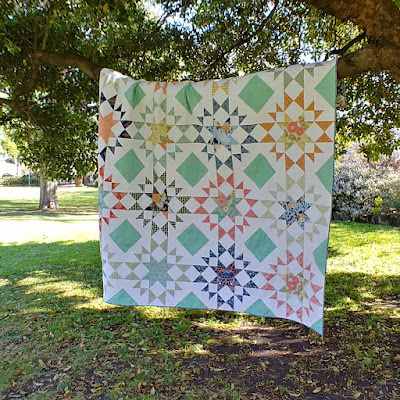 I started this one as part of a quilt-along last year (the #summertripwithme2017) and finished it as part of a similar quilt-along held this year (the #scrappytrip2018). 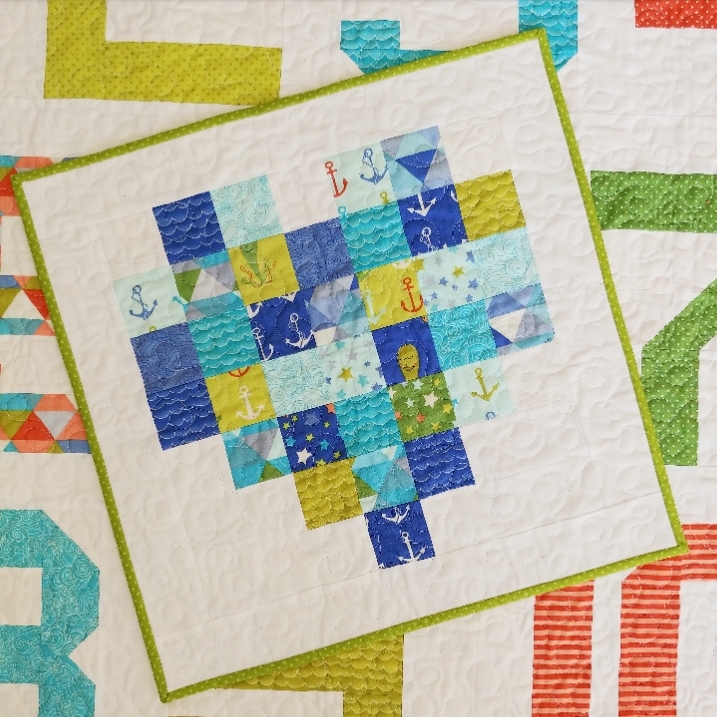 For my version I made slightly larger blocks, using 8 strips to make 16" finished blocks. 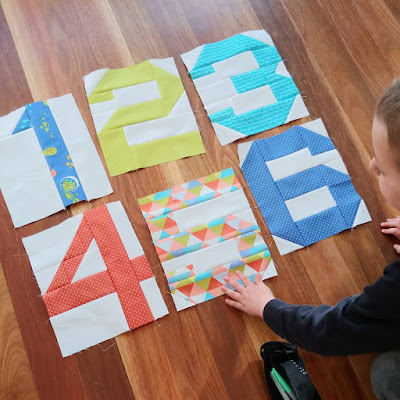 I found making bigger blocks was a more efficient use of the strips (almost no wastage), and faster overall, because I didn't need to make so many blocks. 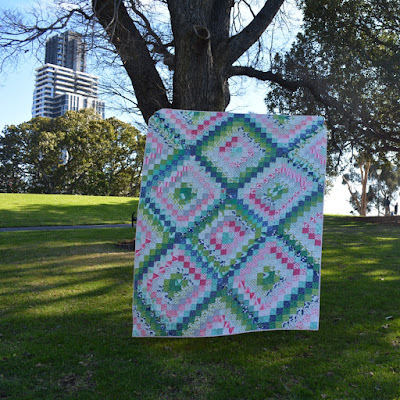 I finished it with a simple diagonal crosshatch in a soft pink thread using my walking foot and hand-sewed the binding. 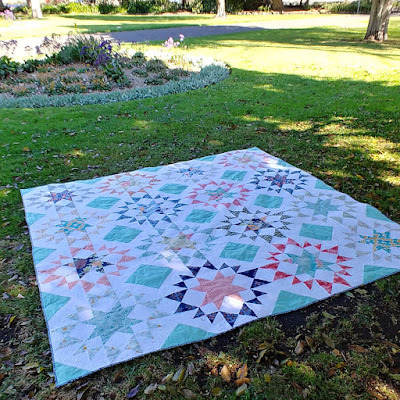 It's already been put into use several times as a backyard picnic rug for my little ones. You can find a few more photos on my original post. I'm linking up with the third quarter finishes party for the 2018 Finish-along, as this quilt was on my list of proposed finishes for this quarter. Today I'm linking up with the quarter 3 finishes linky party for the third quarter of the 2018 Finish-along and sharing my biggest finish for this quarter: my homeward bound quilt made using prints from the Botanique collection by Joel Dewberry. 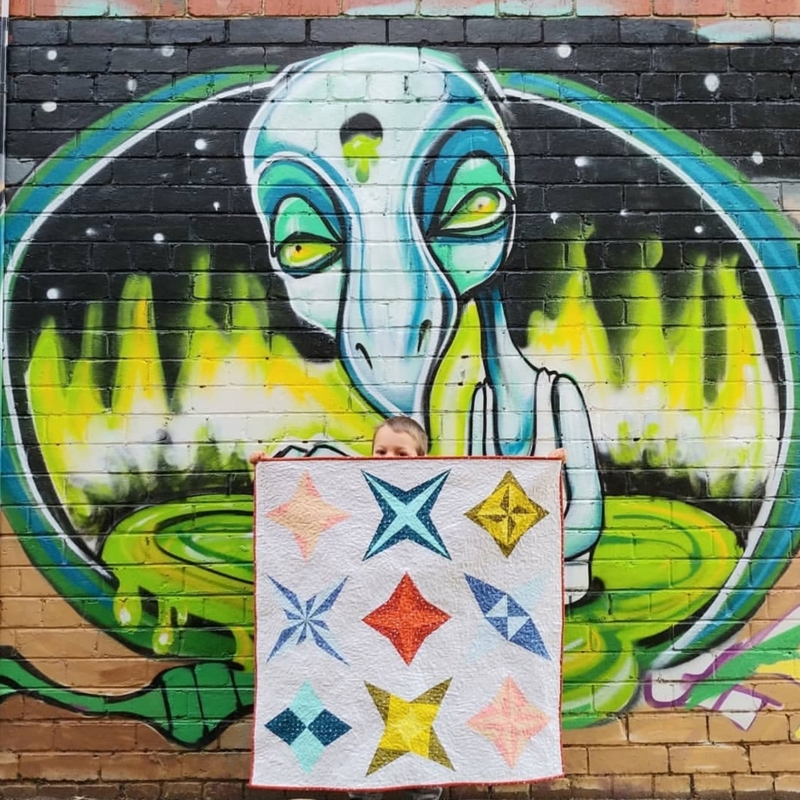 I started this quilt several years ago when testing the pattern for Keera, but stopped about half-way when I realised that there was no way that I was going to be able to finish a 96" quilt on my tiny domestic machine. 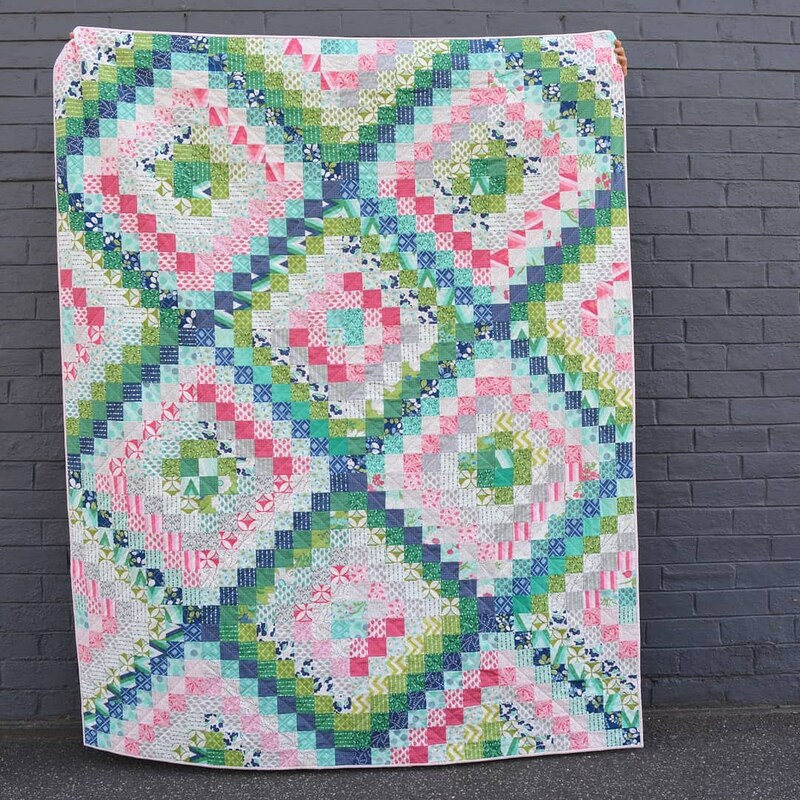 However, I'd been wanting to make a quilt for my sister and brother-in-law, and they have a super king sized bed, so I added this WIP to my list of proposed finishes for this quarter. 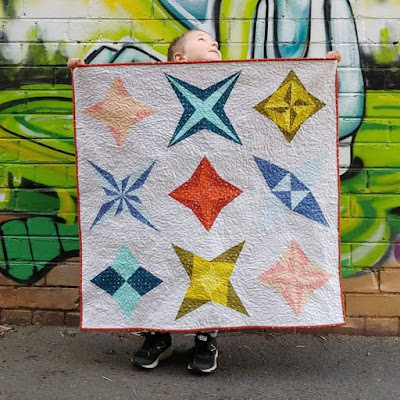 I've been sewing away in secret (my sister follows me on instagram, but hopefully doesn't read my blog :)) and finally finished it last week. 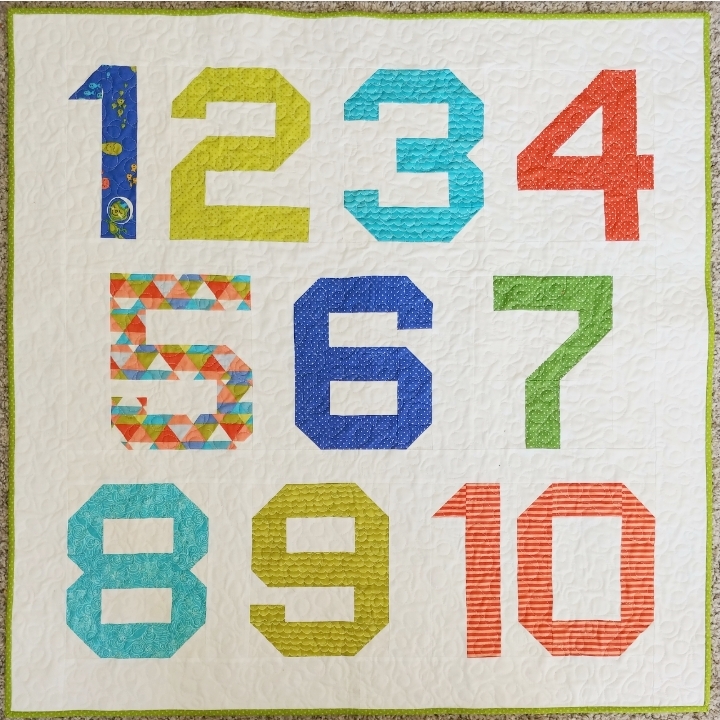 I've now got a slightly bigger sewing machine and managed to FMQ it myself. I can't wait to surprise them with it when they come to visit next month. 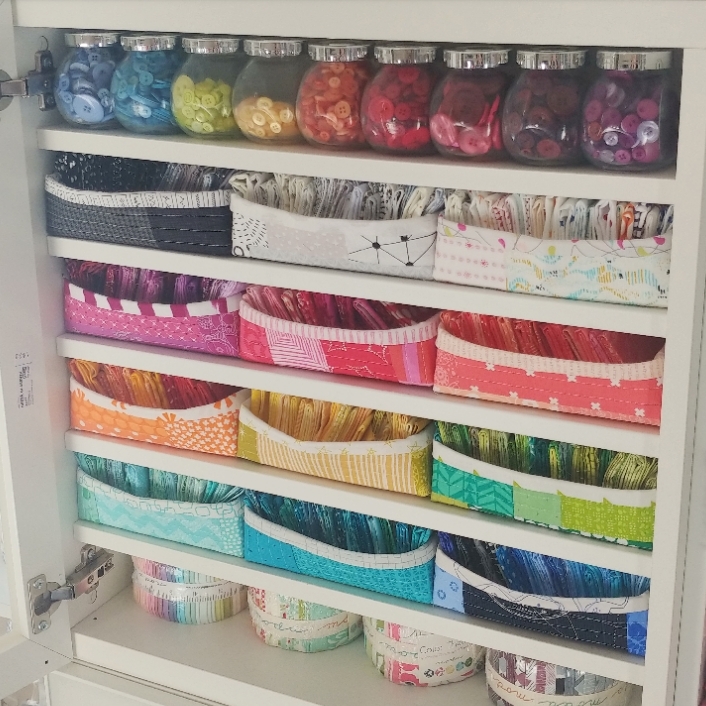 Hopefully I'll be able to get some better pictures too (they are experienced quilt holders :)). Last week my sister gave birth to a beautiful baby boy named Jackson. Before his arrival, my eldest son and I worked hard to make him a couple of baby quilts. 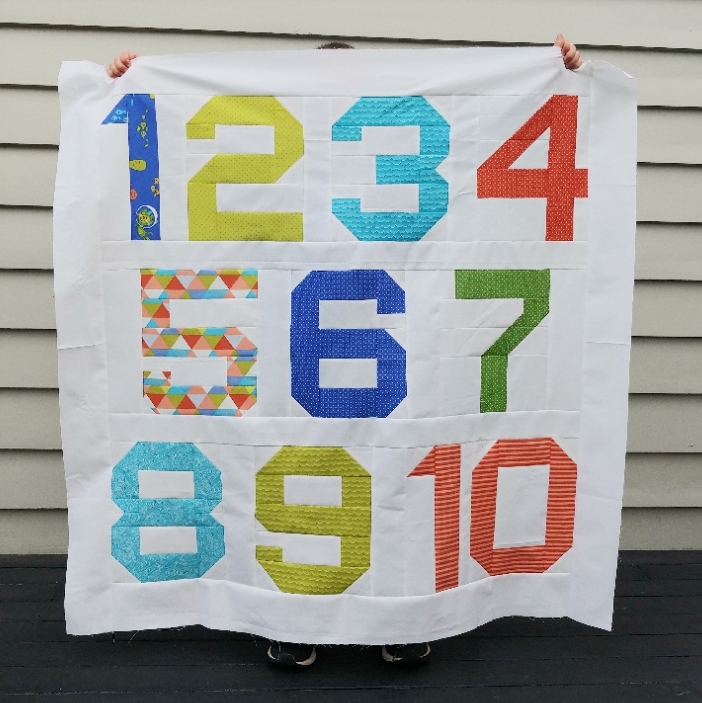 One of the quilts we finished was a number quilt, made using the Spell it with Fabric pattern (from the Moda website) and some leftover jelly roll strips from a cute kid's collection. 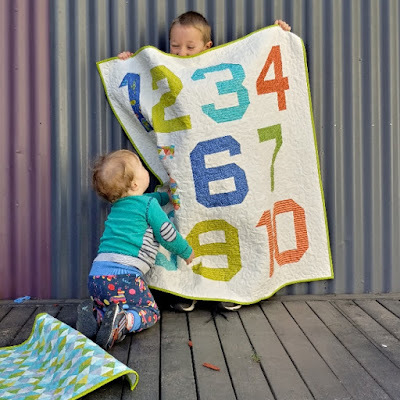 I started this project a while ago, intending it to be a matching wall hanging to the alphabet quilt I made my son for his birthday a few years ago. However, I thought it would be much better used as a baby quilt (and also a quicker finish than starting a new project), so I added it to my list of proposed finishes for quarter 3 of the 2018 finish-along. 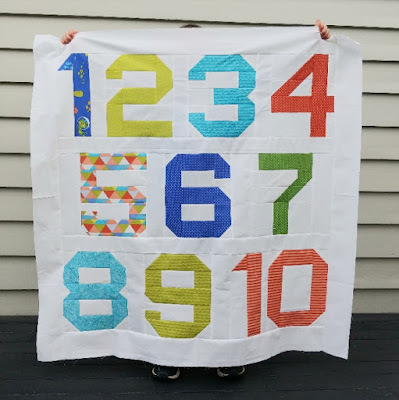 Rupert insisted that we make the numbers 1 through to 10, so I had to play around with different sashing widths to end up with a square quilt. 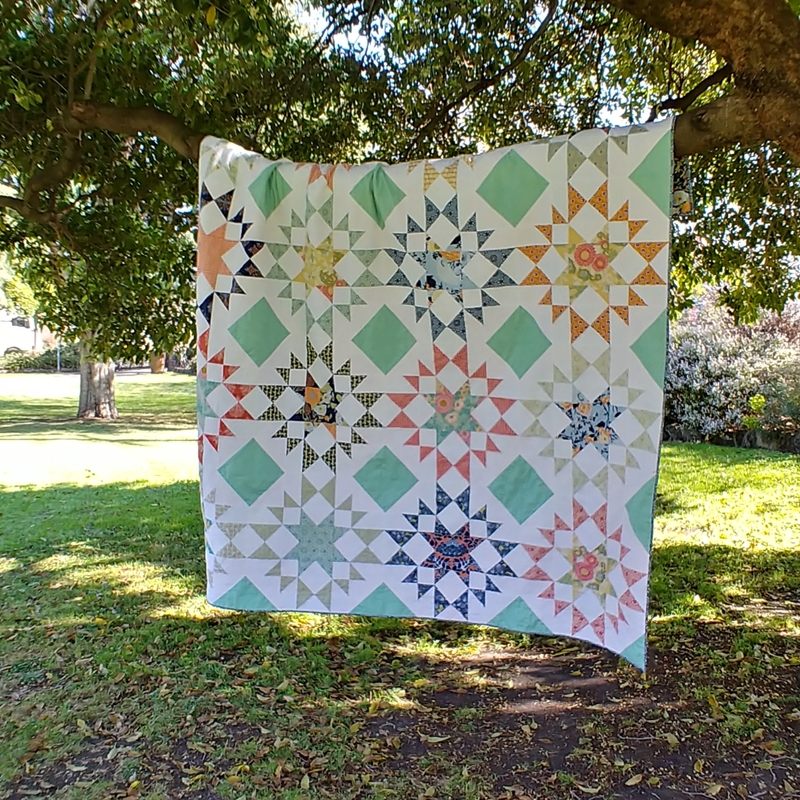 I used a print from an older Cloud 9 fabrics for the backing (I was pretty pleased with how well the colours matched) an quilted it a free-motion loopy design. As with the other quilt for Jackson, we also made a matching mini for big sister's dolly. My attempts at getting my boys to hold the quilts for a photo were a complete disaster, but a lot of fun. 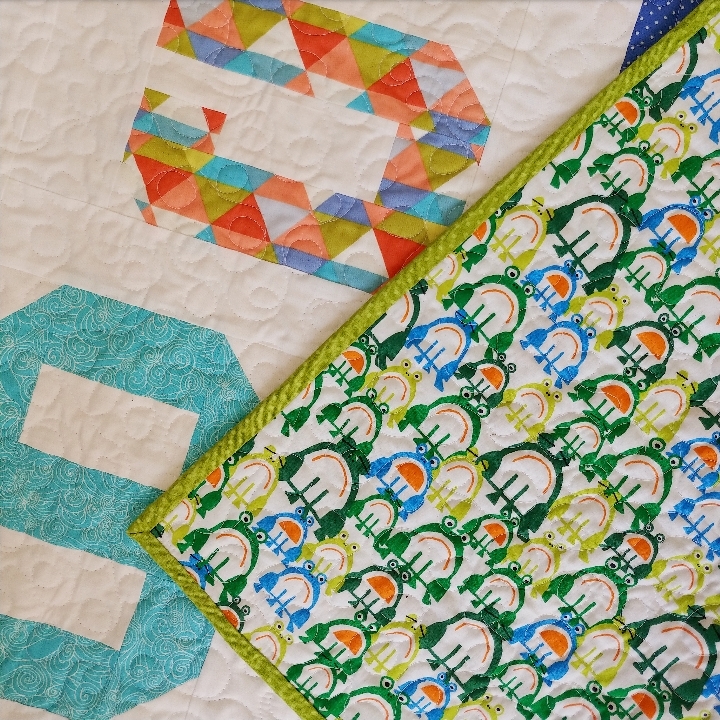 We managed to the quilts washed, dried, bundled up, and in the post a few days before he was born. 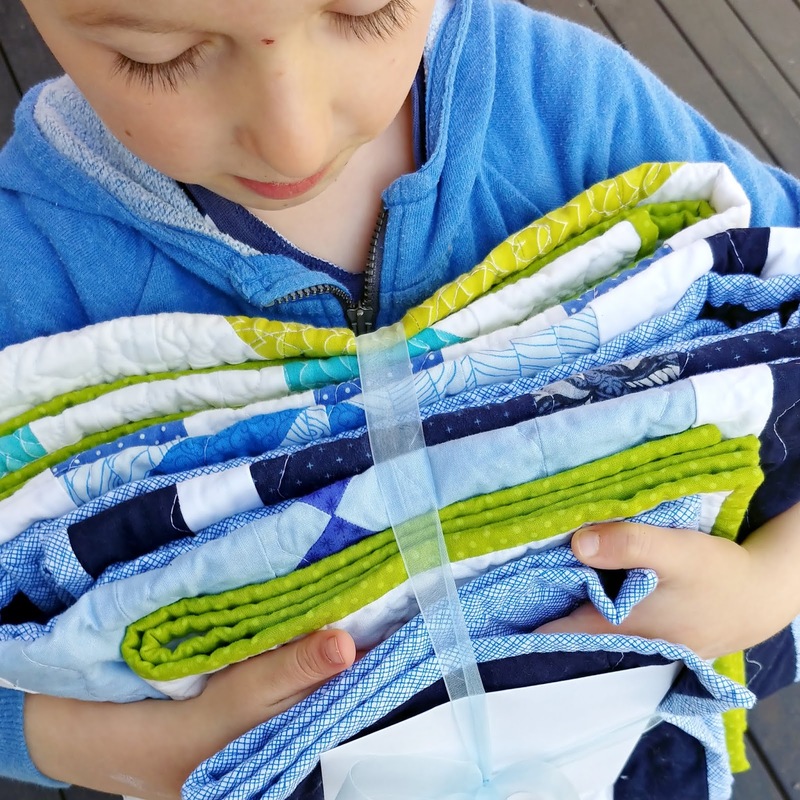 I can't wait to be spammed with photos of Jackson on his quilts. 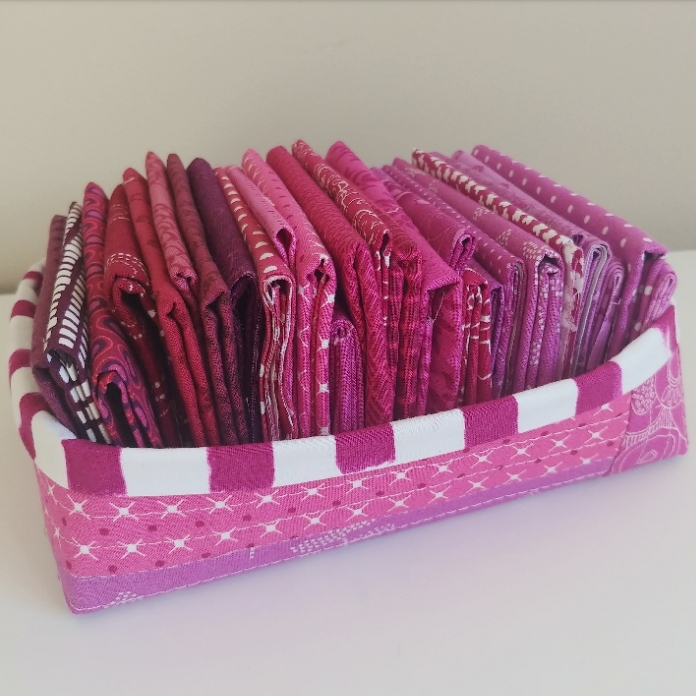 I'd been on the hunt for a while for pre-made trays that would fit nicely on the shelves where I store my fabric. When I wasn't able to find anything suitable, I decided to make my own, using a great tutorial for making custom-sized sturdy fabric baskets by Lillyella Stitchery. I made a prototype in late 2017, but then the project sat on the backburner for a long time. 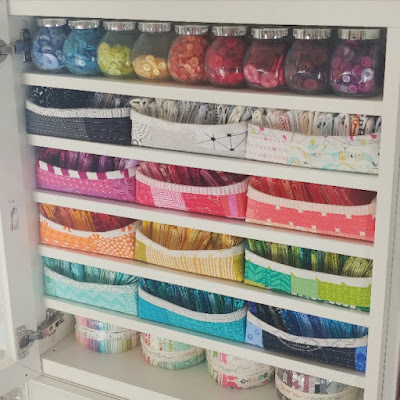 Over the past month or so I've been making some QAYG panels for the remaining trays and finally finished them up over the weekend. I'm too embarrassed to admit exactly how badly I fluffed these up. Let's just say that I wasn't supposed to quilt my fabric directly onto the interfacing. But it was a good exercise in creative problem solving and another reminder why it's not a good idea to start a project and then leave it a year before picking it back up again. They are a bit dodgy in places, but I'm a big believer in 'finished is better than perfect' and think they don't look too bad sitting on the shelf (there's raw edges hiding underneath). 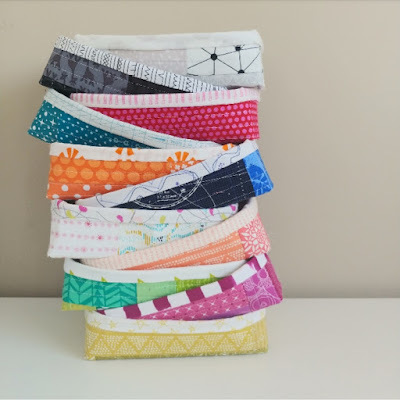 They also do the job they were designed for, which is organise my bits of fabric so I can easily pull out a colour when I'm hunting for prints for a bee block etc. 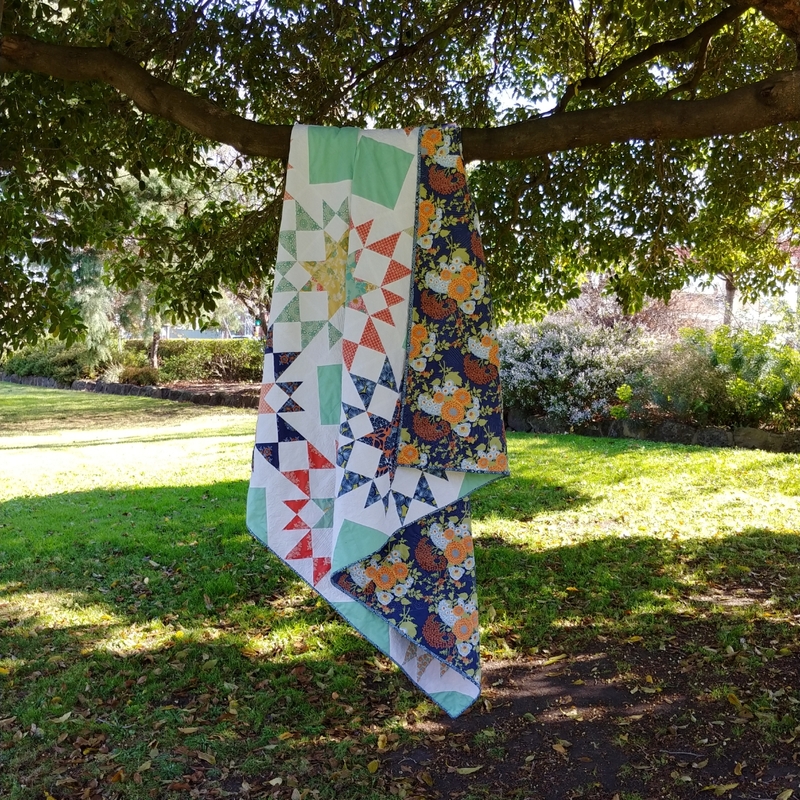 I'm linking up with the Elm Street Quilts One Monthly Goal September link-up and the quarter 3 finishes linky party for the 2018 Finish-along, as this project was on my list of proposed finishes for this quarter was was my specific goal for September. Now I need to decide which of my long-term projects I'll tackle next month.